The first Locomotive Superintendent was Benjamin Cubitt. He died before any trains ran but did order 50 2-2-2 engines from Sharp Brothers. Denison acted swiftly and engaged Edward Bury, the well known locomotive engineer, to fill the vacancy. Bury had other interests, especially in Bury, Curtis & Kennedy locomotive builders. The GNR was not satisfied that his locomotives were suitable for their operation and removed him. The next superintendent was a Scot, Archibald Sturrock. He came from the Great Western Railway (GWR). At the time of Sturrock's appointment, locomotive boilers were usually pressed to no more than 100 lb/sq.in. Sturrock had other ideas; his first engine, and most of his others had a working pressure of 150 lb/sq.in. He was also the advocate of a large firebox and grate area. Visually, his designs bore many similarities to those of Swindon, but the gauge (the GWR being broad gauge at that time) and boiler pressure made them very individual. He was given instructions from the board to produce suitable machines to fulfil the company's objectives (speed) without reference to expenditure. All of Sturrock's locomotives were built by outside contractors because at this time, the company's workshops were being moved from Boston to Doncaster and Doncaster was not ready to start on new builds. One of his notable engines was an 0-6-0 with a "steam tender", i.e. the tender was powered by two 12"x17" cylinders, in addition to two 16"x24" locomotive cylinders and a grate area of 23.6 sqft. Although these were successful machines, they were not popular with the firemen and most of the tenders had their cylinders removed in due course. Sturrock retired in 1866 after marrying into wealth. The next Locomotive Superintendent was another Scot, Patrick Stirling. He was renowned for his 8ft 4-2-2s. He did produce other notable engines including some 7' 7" 2-2-2s which were arguably as good as the 4-2-2s. His last design of 0-4-4 tanks for suburban services (LNER G1) were not really surpassed until Gresley's N2s. Stirling did not follow the example of his predecessor; initially his boilers, fireboxes, grates and boiler pressures were less than in Sturrocks's designs. Over time, he did change his views. In 1895 Stirling died in office aged 76. His replacement was H.A. 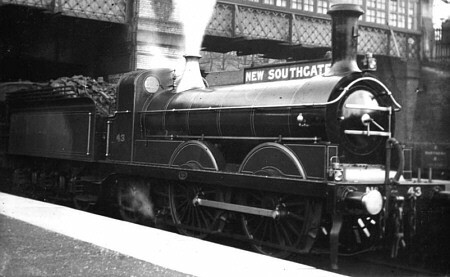 Ivatt who came from the Great Southern and Western Railway, in Ireland. At this time, trains were becoming heavier; the GNR had introduced new clerestory stock on six-wheel bogies and to stop the practice of double heading, in 1898, Ivatt produced the first British Atlantic. Ivatt reversed the principal set by Stirling and used a fairly large boiler with small cylinders. Four years later, the large boiler Atlantic was produced but the cylinders remained the same. In fact, the tractive effort of the Atlantics was less than that of the Stirling 8 footers. Nevertheless, they were very successful engines and in later years became even more so. A very significant event took place in 1905, which later, had a dramatic effect on the future of both the GNR and the LNER; H.N. Gresley was appointed Carriage and Wagon Supervisor. When Ivatt retired in 1911, Gresley took his place and Edward Thompson from the NER, became Carriage and Wagon Supervisor. Gresley wasted no time and his first design was for a Mogul with outside Walschaerts valve gear - both those features being novel for that time. He had decided that the advantages of three cylinder locomotives were desirable; both the GCR and NER had produced heavy duty shunters with three cylinders and the NER was pursuing this arrangement with other engines, notably the Class Z Atlantics. He also thought that the provision of three separate sets of valve gear was unnecessary. So in 1918 he brought out a three cylinder 2-8-0, No. 461, with two sets of Walschaerts gear for the outside cylinders and a fairly complex arrangement which derived valve events for the inside cylinder from both the outside sets of gear. He then had discussions and a meeting with Harry Holcroft, who had already patented a similar arrangement whilst employed at Swindon. From this meeting, the second and final derived valve gear was produced. Gresley always maintained that it was his invention and acknowledged Holcroft's help but was not willing to share the patent. It is not known whether this was quite fair. In the meantime, Gresley had been experimenting with the Atlantics. He eventually found that a high degree of superheat with larger cylinders transformed a reasonably successful locomotive into one that was exceptional. The first three cylinder engine with the new derived gear was his K3 2-6-0, No. 1000. As with many Gresley locomotives, this caused a stir mainly due to the 6ft diameter boiler. He used a high degree of superheat and large diameter valves. What was really an express goods engine was tried on passenger trains and easily handled heavy expresses at over 75 mph. 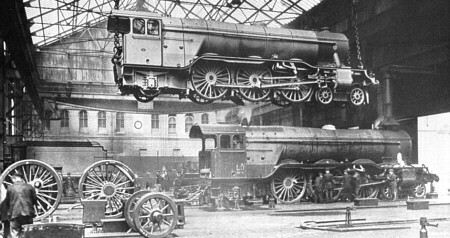 In the final year of the existence of the GNR, Gresley produced his first Pacific. Although this locomotive was deemed successful, they were rather heavy on coal and water and, like the Ivatt Atlantics, were yet to sparkle. Thank you Malcolm Peirson for the photographs of No. 43 and the two A1s under construction.